This is a guest post by 6x6. For those of you long-time followers, 6x6 guest-posted her introduction to running way back in Eat Run Read’s early days (read parts 1, 2, 3, 4, 5, 6). And obviously she makes regular appearances in my life, and consequently, on my blog. Last night she had a fantastic dinner, and wants to tell you all about it. It all started last year when a coworker and I were planning our office’s holiday party. The office was only five people at the time (now we’ve grown to ten! 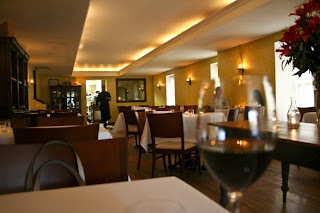 ), so the planning only consisted of making reservations at an extravagant restaurant of our choosing. 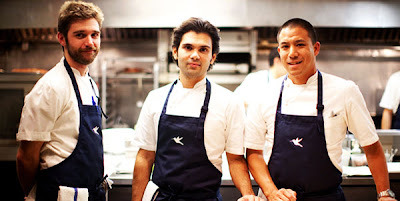 Naturally, said coworker and I pushed for the tasting menu at Komi, the number one restaurant in Washington, DC. Our plans were thwarted by a fellow employee, desperate to gnosh at the POVBar on top of the W Hotel. As much as I love a restaurant with a good view, the POV Bar seriously disappointed and said coworker and myself harbored resentment over this for nearly a year. Fast forward to this fall, when I was accepted into my dream graduate school program in South Africa. In secret celebration, as we are certainly not telling anyone at my office, she and I went out last night to celebrate. I had no idea where we would be going. No, we were not. However, we pulled up in front of JRs bar on 17th Street and I was hopelessly confused till we started walking right past to Komi. 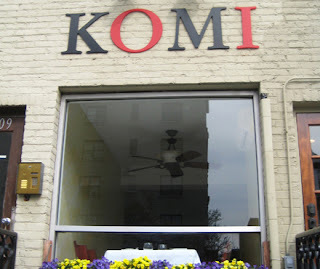 As soon as I saw the modest sign for the restaurant, I knew immediately what we were doing: the famous tasting menu at Komi! Komi is a small, softly-lit, Mediterranean-style restaurant that sits no more than 50 people at any one time. There is a clear view into the kitchen, where you can watch the incredibly attractive chefs prepare the meals. (Interestingly note, apparently, I am not the first to have noticed this...the attractiveness, I mean.) 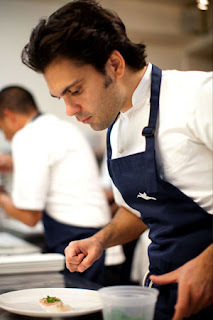 Head Chef Johnny Monis developed a reputation based not only on his food, but his looks. According to The Washingtonian, this is a reason that many women and men frequent the restaurant. The tasting begins with six small bites. Mine pescatarian and my coworker's carnivorous. Each bite was intricate and delicious. With nearly every option we both said, “this is the best _____________ I’ve ever eaten.” That’s never happened to me at a restaurant before. My personal favorite was the spanakopita that had a liquefied spinach core that the waiter instructed us to eat with one bite or be condemned to immediate disaster. He was right; the spinach was liquid and exploded in my mouth. Spanakopita- one of my favorite dishes ever- will never be the same for me ever again. My coworker’s favorite was a date filled with mascarpone cheese, roasted, drizzled with olive oil, and precisely adorned with the perfect amount of sea salt. It was about the size of a thumb, but it was so rich that we ate each of ours in at least four bites. They served several more mini-dishes that featured various types of raw fish and lightly dressed with olive oil and sea salt. For the main course, my coworker had roast suckling pig with bacon and I had a soft, light, white fish that had been cooked in egg whites. It was beautiful. Our waiter, Adrien Brody’s blond twin brother, brought out fresh homemade pita with a Greek tapenades platter that included a red onion mustard sauce, tzatziki sauce, radishes, sea salt (of course), and small red peppers. We handmade our own mini Greek sandwiches and so each bite was ideal. There were four dessert bites. The first had cheddar ice cream on top of a squash cornbread, the second was apples in phyllo dough with a frozen Greek yogurt, the third was a brown butter cake soaked in Vermouth, and the final (by final, I mean favorite) was a miniature peanut butter chocolate tart. For both of us, the tart was the best peanut butter dessert we have ever eaten, which I realize is a powerful statement. Needless to say, the meal ended on a good note. With great thanks to Komi, and the best coworker ever, eating at normal restaurants has officially been ruined for me. Komi has left enormous shoes to be filled for every future trip to a restaurant that I take.